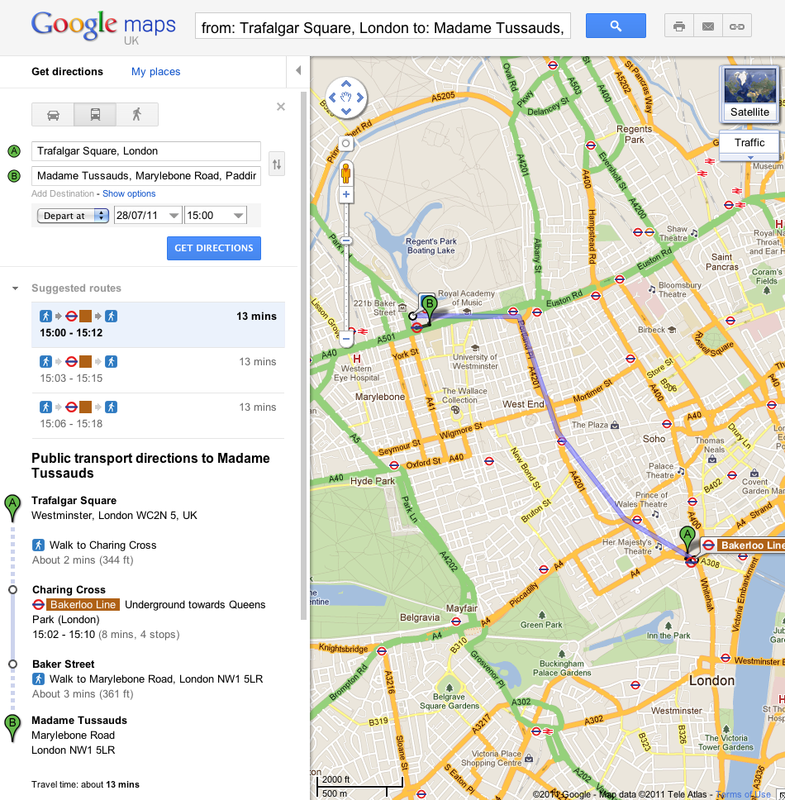 Starting today, you can get public transport directions for London within Google Maps. One of Europe’s largest metropolitan areas, London is a major destination for both business travelers and tourists. More than 1 billion passengers are serviced by Transport for London (TfL) every year across over 18,000 bus stops and over 250 Underground stations. 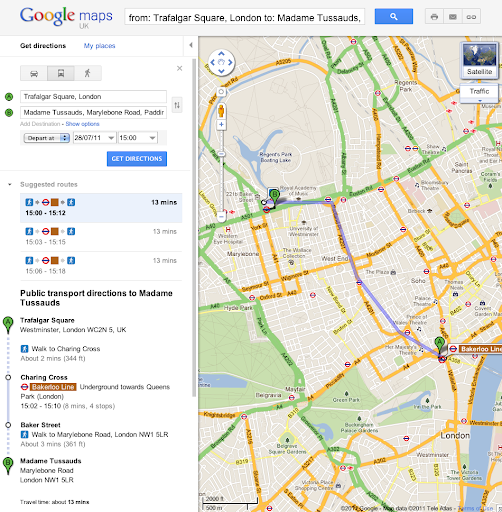 Let’s say you’re at Trafalgar Square, and you want to visit Madame Tussauds. With a simple directions search, you’ll see all the possible public transport connections. 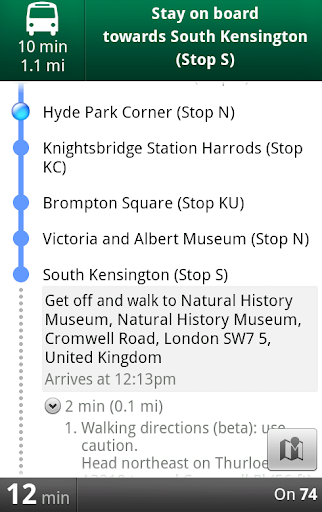 In Maps, click “Get directions” in the left-hand panel, and then the train icon to see public transport directions. Enter your departure location next to A, and your destination next to B. These can be either street addresses or names of popular places, businesses or restaurants. When you’re done, click the “Get directions” button and suggestions for your trip will appear below. Public transport directions are available on both Google Maps and Google Maps for mobile, so you always have access to a trip planner. When you’re on mobile, Maps even uses your current location to determine the best trip to your destination. Just search for your destination location, select it on the map and choose the “Directions” option. The suggested trips will be based on your location by default, and provide you multiple alternatives whenever possible. If you’re using an Android-powered device, you can also get public transport directions with Transit Navigation (Beta) in Google Maps. With this new feature, which we launched earlier this month, you’ll get alerts when it’s time to get off the bus or train at your destination or to make a transfer. 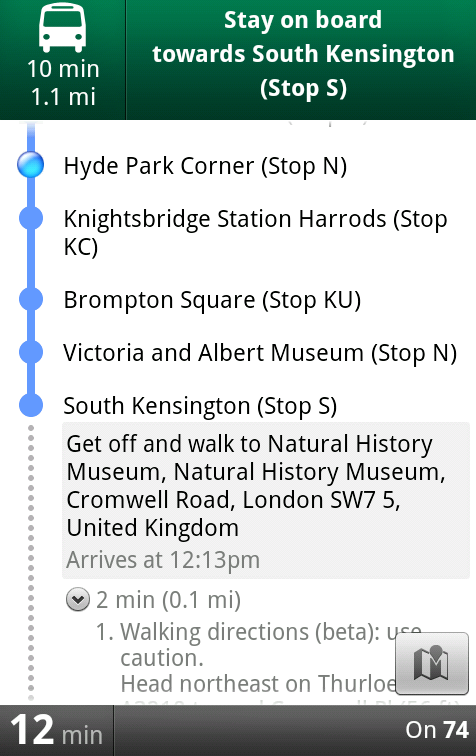 Transit Navigation is available in all regions where public transport directions are available, including London. TfL is among the first agencies in a major European city to make its timetable information publicly available through the London Datastore. We’re strong supporters of open data and bringing information out into the open, and believe that making information publicly accessible can be an enormous engine of economic growth and innovation. ITO World has been a great partner in this launch by ensuring TfL’s data was adapted correctly and ready for our use. Public transport directions are available for all Underground, bus, tram and Docklands Light Railway (DLR) lines, and we’ll include more public transport information as soon as it’s available. Whether you use public transport every day or infrequently, as a commuter, on a business trip or as a tourist, we hope that public transport directions in London make planning your trips more convenient!